If you run a blog or manage blogs for someone else then you are constantly looking for ways to grow your readership. Often you spend a lot of time brainstorming about new ideas. And yet the results are not as per your expectations. One of the major troubles is that whenever you try new things there are huge risks involved. So it's not just your time but also your money that is at stake. Therefore, it becomes very important to have some guidelines and references before proceeding with anything that you haven't tested yourself before. One of the most tried and tested ways to grow readership and build a loyal readership base is email marketing. If you ask any successful email marketer about his success he/she will talk about various data and statistics that proved instrumental to his/her work. But the thing with metrics is that there is so much of data available today that it become very difficult to get hold of what would work better and what wouldn't. In order words the confusion is all pervasive and often it can get a bit overwhelming for the marketer to proceed. It is therefore important to standardize the process based on available analytics that have proven themselves over the course of time. The fact of the matter is that with so many different aspects of email analytics to consider, it can be tough to know which numbers really matter. 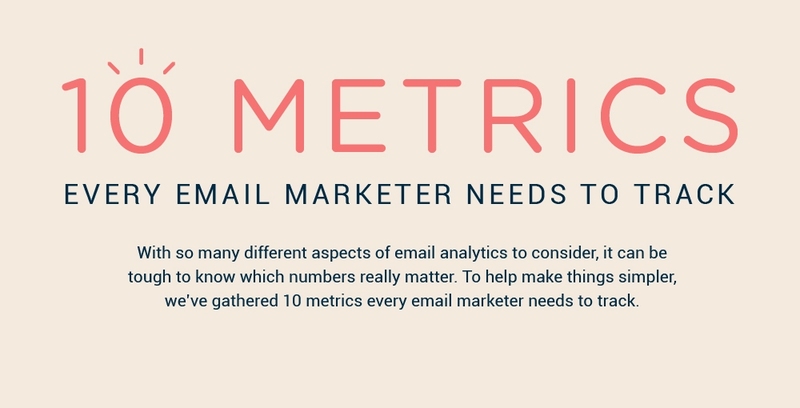 To help make things simpler, we’ve gathered 10 metrics every email marketer needs to track. is the simplest email marketing KPI, and vital to understanding how well your subscribers are receiving your messages. Open rate simply tracks how many subscribers opened the email you sent. is another common metric that can be telling of how well your campaigns are performing. CTR measures how many people clicked on the links in your email. For example, if you included a link to redeem an offer, the CTR would measure what percentage of subscribers clicked on your links.